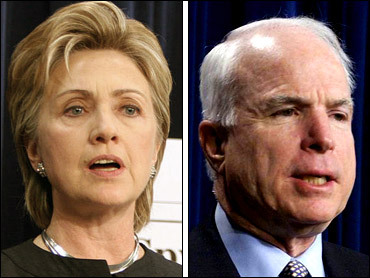 Republican John McCain is accusing Democratic rival Hillary Rodham Clinton of indecisiveness on foreign policy, arguing that the nation can't afford a post-Sept. 11 commander in chief who employs a triangulation policy. In prepared remarks, the GOP presidential candidate assails the Democratic front-runner and indirectly singles out former President Clinton. During his tenure, some advisers urged him to make policy decisions by splitting the differences on opposing views, which became known as triangulation. The Associated Press obtained excerpts of McCain's remarks. "The Democratic front-runner wants to have it both ways when it comes to foreign policy. On the one hand, the New York senator voted for the Iraq War. On the other hand, she now opposes it - sort of. On the one hand, she wants a firm deadline for retreat. But, on the other hand, she says we cannot abandon the nation to Iran's designs," McCain says in remarks he plans to deliver Wednesday at a South Carolina military academy. "Senator Clinton, this is not the '90s," McCain says. "This is the post-September 11 world. The commander in chief does not enjoy the luxury to conduct our national security by means of triangulation." However, before the speech, the campaign said that McCain decided not to deliver the remarks. "It has nothing to do with the content of the speech. It has to do with the with the venue," an aide said. "This isn't the appropriate venue for that." The Clinton campaign said the two senators, both members of the Armed Services Committee, "have an honest disagreement on the war." On Tuesday in Florida, McCain met with Republican Gov. Charlie Crist and said what the popular governor wanted to hear on issues such as insurance and oil drilling - unlike rival Fred Thompson during a meeting two weeks ago. McCain said he's opposed to drilling in sensitive areas such as the Everglades and that decisions about drilling off the Gulf of Mexico coast should be left up to the state. "In the case of the Everglades, the people of Florida have decided they don't want that tampered with for a variety of reasons and I totally agree. And I do not believe in drilling in the Grand Canyon, either," McCain said. When Thompson was asked about drilling in the Everglades while sitting in the same Tallahassee office, he said he wouldn't take anything off the table. McCain said he supports the idea of a national insurance backup fund to help stabilize the property insurance market, as long as it doesn't cost policy holders in states that aren't disaster prone. Thompson told Crist he couldn't make a commitment on the issue that's one of the governor's top federal priorities, saying he needed to learn more about the idea. "I believe that this issue must be addressed," McCain said. "We all know the problems that have existed here, and we know that there is a role for the federal government in natural disasters. What I want to do is make sure that that's equitable and my good citizens in the state of Arizona don't have to bear an undue burden." When asked about Thompson's remarks after that meeting, Crist said, "I wasn't completely overjoyed." On whether he was happy with what McCain said on Florida issues, Crist said, "Very much so." While Crist hasn't endorsed a candidate, he has had a close relationship with McCain. The Arizona senator endorsed Crist during last year's Republican primary and then appeared with him on the day before the general election - the same day Crist turned down an opportunity to take the stage with President Bush. McCain planned a three-day campaign trip through the early voting state of South Carolina.